Can an iPhone user learn to love Android? 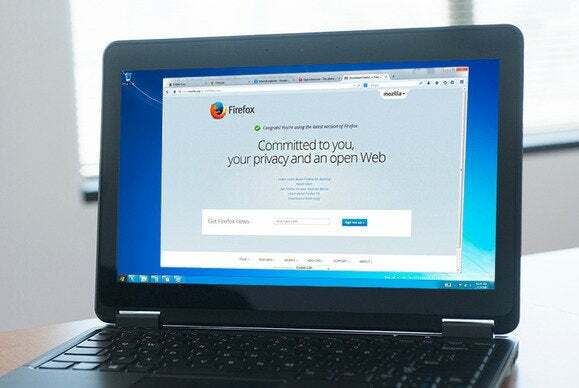 Firefox updates appear fairly regularly, but for the most part they’re mundane. You get a message saying it’s checking plug-in compatibility, it finds no issues (mostly), then it’s business as usual with no obvious changes. Ho-hum. Back to work. Not this time. I guess that with 30 approaching the Mozilla folks felt it was time for a makeover. Or perhaps they wanted to make Firefox more accessible for people cross-grading from Internet Explorer or Chrome. Whatever the reason, Firefox 29 is a decidedly non-boring upgrade. It delivers an entirely re-tuned interface that’s easy on the eye and easier to use. Firefox 29 is better looking and more efficient in nearly every regard, as well as reminiscent of Chrome. In support of my cross-grade theory... One of the most obvious interface changes is that the default placement for the menu is now on the right, where IE and Chrome put theirs. Mozilla has even smartly appropriated the icon of horizontally stacked bars that Chrome uses for its drop-down menu. The new Firefox drop-down menu should invoke envy in the competition. Mozilla has also done a very nice job of rendering the new menu with readily recognizable icons. I now find Firefox’s settings and features far easier to navigate than IE’s and especially Chrome’s, where before I would’ve said the opposite. You can also customize the new menu via a slick drag-and-drop routine. 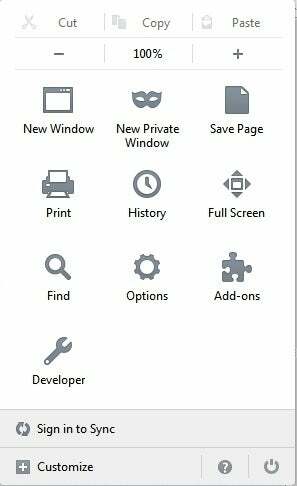 The same customize tab has options for restoring the old-style menu, the old-style bookmarks toolbar, and the Window title. Yes, you can pretty much turn the clock back to 28 if you wish, at least functionally. The new, gracefully-rounded tabs are a lot easier on the eye, and Mozilla has also changed the placement of the back and forward buttons. The latter directly abuts the URL field, which, while it takes some getting-used-to, will save a lot of mouse movement over the long haul. Instead of the forward button being grayed out as it used to be, now it’s not even visible unless you actually have something to move forward to. Nice. But my favorite new feature is expedited bookmarking. Click on the star, and there’s a nice little animation to let you know the current page as been bookmarked. That’s it. No dialog asking you to confirm, a redundancy which has driven me nuts for a long time. The number of times I want to leave things be far outstrips the number of times I want to edit a bookmark title. When I do want to edit it, I’m perfectly willing to do so post facto. 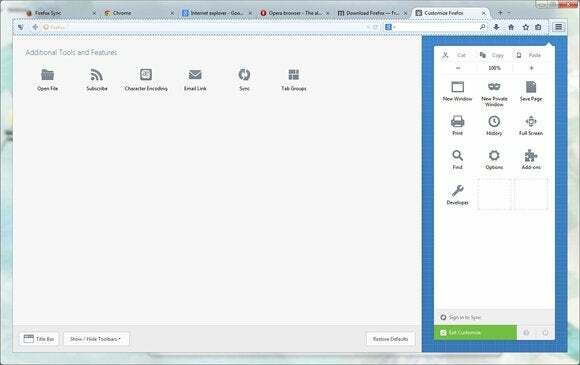 The customize tab features drag and drop. Easy peasy. 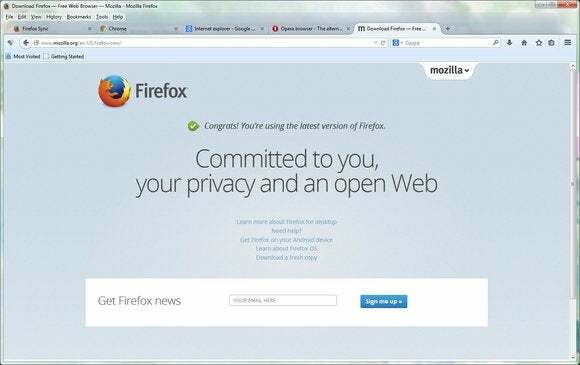 There’s not much new internally to Firefox 29, but that’s okay; HTML5, etc., is all there already. That said, there have been some improvements to Yahoo searches (HTTPS) and the way you access your Mozilla Sync account for syncing bookmarks between devices. I use Chrome, IE, Firefox, and Opera—largely to delineate my work-browsing from my private-browsing, though IE’s ActiveX support does have some advantages for IT work. Otherwise, they’re all more or less technologically equal. I’ve been using Chrome the majority of the time partly because it’s super-stable, but also because it offers my favorite text-to-speech app in SpeakIt! 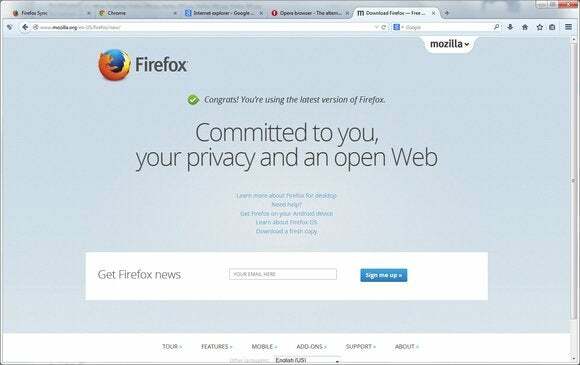 Opera is fun and has some nice interface perks, but the new version of Firefox has me seriously thinking of cutting back to one (plus IE for the odd corporate gig). I find it the most visually appealing of the bunch, as well as the most intuitive when it comes to changing settings. My only interface gripe is that Mozilla didn’t rework the options dialog to match the new look. Perhaps they’re saving that for the big Three-Oh. My real gripe and a major disappointment was not being allowed to paste into the CMS editor I use for posting articles. Sigh, that cost Firefox a half-star and rendered my plans to make it my one-and-only unfeasible. Hopefully, this is something that will be fixed very soon. You can add back the window title, old menu, and bookmarks toolbar if you wish. You probably won't. Opinions vary, but I truly don’t understand the griping I’ve seen online about the new interface, or the publicity it has garnered. This isn’t Windows 8—you can turn back the interface clock via the customize tab and basically clone the old interface via a third-party plug-in if you so desire. However, unless you’re freakishly averse to change, you shouldn’t want to: 29 is a cleaner, easier design with an improved workflow that will save you time and make your life easier. Really. The Mozilla folks have cherry-picked the best bits of the competition and added some very nice touches of their own. Sweet stuff from a vendor that doesn’t want to rule the world. The latest version of Firefox sports a visual makeover and design, that in our opinion, vaults it to the top in both appearance and efficiency.